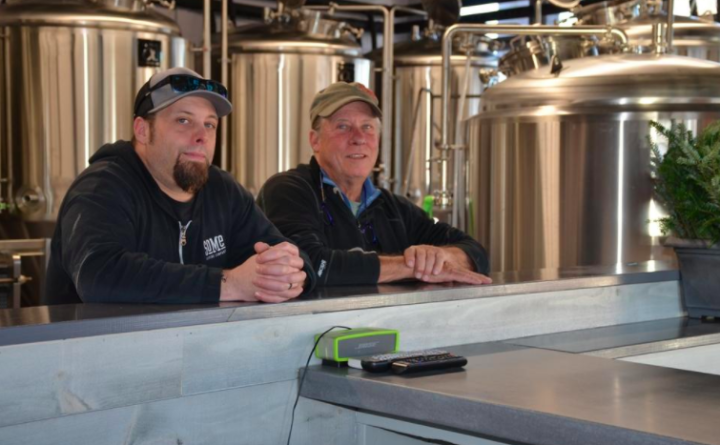 Dave Rowland Sr., right, and son David Rowland Jr. are eagerly awaiting the opening of their second brewery, York Beach Brewing Company on Route 1A. Everything's in place, but they need the partial government shutdown to end. YORK BEACH, Maine — The old York Beach Post Office is getting a major facelift, enabling a father-and-son team of brewers to expand their brewing capacity and offer a new beer drinking experience at the beach. But not until the end of the government shutdown. Dave Rowland Sr. and son David Rowland Jr. opened SoMe Brewing Company five years ago on Route 1 and both are eagerly awaiting the opening of their second brewery, York Beach Brewing Company on Route 1A. The brewery is ready to open, but Rowland Sr. said the federal government shutdown has delayed issuance of the Brewers Notice from the federal Tax and Trade Bureau. The Rowlands have been asked for months when their new location will open, but until the Brewer’s Notice is issued, it cannot receive its state business license to open. SoMe is pronounced like “some,” even though the trademark lines under the o and e play a word game with Southern Maine. The five-year-old brewery has 83 barrels of fermentation capability and with the addition of York Beach Beer Company, another 40 barrels will be online to help the Rowlands keep up with demand and provide space for future growth, Rowland Sr. said. Property owner Jim Fitzgerald had been preparing the old York Beach Post Office for a new tenant and has helped the Rowlands since they started renovations in March 2018 for a 100-seat tasting room, 70 inside and 30 outside. SoMe’s most popular beers, Apostrophe IPA and Whoopie Pie Stout, will likely be on tap at York Beach Beer Company as well, but Rowland Jr. said the focus will be on lower alcohol by volume selections, such as pilsners, Mexican-style lagers, Gose, Berliner Vice and some sessionable IPAs. A landscape designer by trade, Rowland Sr. started brewing beer when the home brew trend started in the early 90s. When his son was young he would help brew. And Rowland Jr. said his interest in craft brewing peaked during his college years. When his history teaching job in New Jersey was eliminated due to budget cuts, Rowland Jr. accepted an offer to work construction with his dad, who was then retired and living and working in Lake Placid, New York, and would commute home on the weekends. “So, during the week we’d build houses and garages and all sorts of projects and then we’d brew. We built an efficient system, so we’d brew all the time. We’d always talked about opening a brewery someday. I brewed 10 years before we got into it, then we moved here with that goal in mind,” said Rowland Jr., whose wife, sister and mother are active in the brewery as well. Rowland Sr. said he thought the brewery would be in the Adirondacks, but his son encouraged him to visit the York area, where his wife’s family vacationed. “I told him ‘Dad, you got to check out Maine. We love it there.’ And since York didn’t have a brewery it made sense,” Rowland Jr. said. Rowland Sr. said today is like the old, pre-prohibition days, when local breweries were the norm. After prohibition, he said, the big breweries took over the market and it has taken a long, long time for the current, hyper-local, craft beer explosion to build.